Matrox is a very old niche video solutions company and they have recently revealed that AMD is on-board to help them produce the next generation of Matrox GPUs. These GPUs are going to be used mostly for massive Multi-Screen setups and analog specific video editing. [Dramatization] Introducing the Matrox Millennium GPU powered by the IS Storm Core. Clocked at an insane frequency of 50 Mhz and powered with a 32 Bit VGA core this is the card for your 2d and 3d Graphics needs. 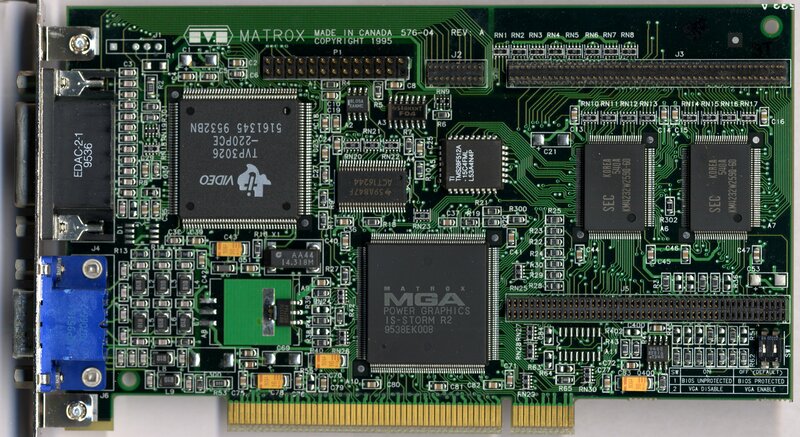 The Matrox Millennium rocks a massive 8MB of SGRAM. Supporting resolutions of upto 1600×1200 in 256 Colors and DOS Performance of 6100 in PC Bench 9.0, this is the best your money can buy! Not a lot of people know about Matrox but it is a very very special company in the tech world. Back in the golden age, Matrox was a high-end 2d graphics company right there with our giant duo and the legendary 3dfx. Notably, it released the Matrox Millennium GPUs that could be considered the ‘Titans’ of the 1990s. However with the revolution of the 3d Graphics, Matrox started lagging behind its rival siblings. It decided to quit and focus only on niche markets leaving 3dfx, Nvidia and AMD alone in the ring. Not much is known about the GPUs at the moment though we do know the preliminary specs. 28nm Process, 1.5 Billion Transistor Count, DX 11.2, OpenGL 4.4 and Open CL 11.2 coupled with a 128bit Interface. These specs make me think that we are looking at a Cape Verde PRO chip since all the specs slot in almost perfectly.